It has been 5 years since I’ve started to follow this beautiful motorsport, the F1. A year has passed since the last Mexico GP and now it’s back to bring the fans beautiful sounds of fuel combusting inside the motors, the particular smell of burning tires drawing patterns over the asphalt, the sparks flying from the brakes, and of course the roar of the fans cheering for their favorite drivers (which mostly was for Esteban Gutierrez and Sergio Pérez as we had the fortune of having to Mexican drivers on the track). I arrived in Mexico City on Thursday evening and had a delicious bagels for dinner and a restful night of sleep in preparation for a long next day. 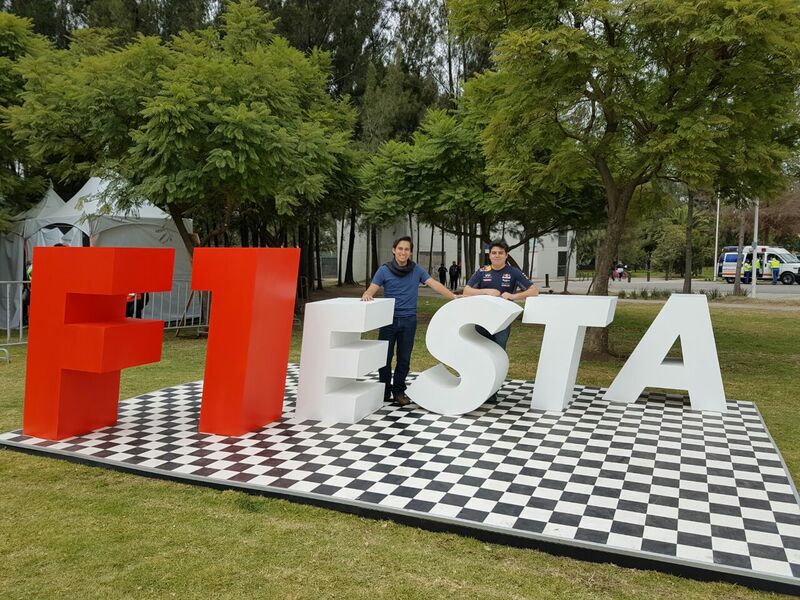 I was looking forward to attending the early morning practices and taking some photos before the full excitement of the main event in the following days called #F1ESTA, which means “party” in Spanish. The start of the day was slow. I didn’t think that many people would be there for the practices. I started to see people wearing gray, red and blue in the Mexico City subway. 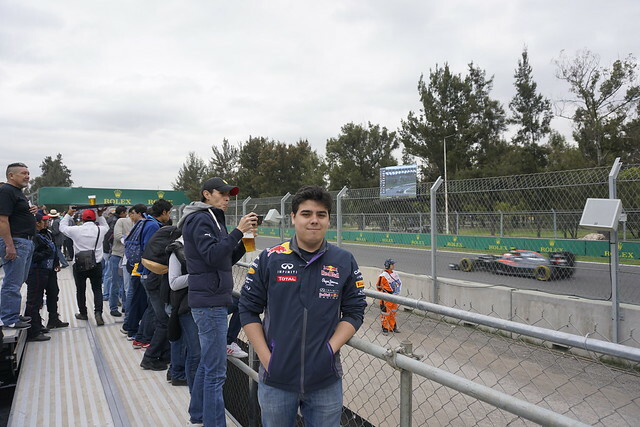 As I was getting closer to the racetrack Hermanos Rodríguez, I could feel the excitement growing within me; it was the first time that I was going to see and listen to an F1 car on the track. I arrived at the venue with a friend and started to look for our designated entrance gate. 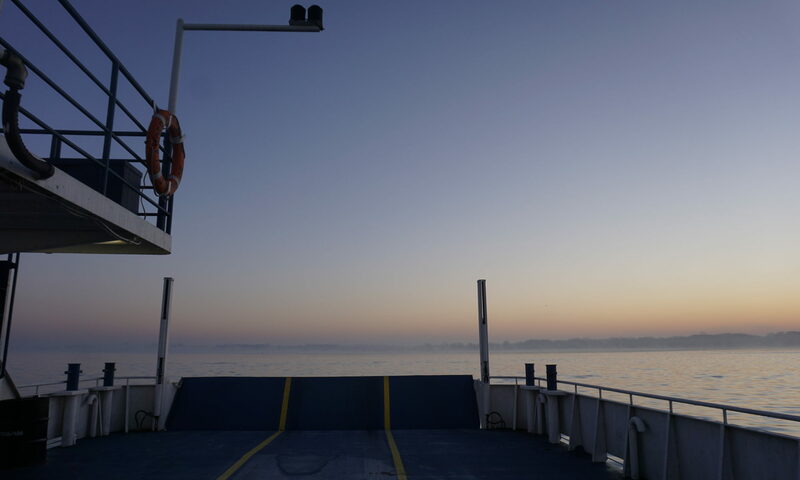 Being a couple hours early before the practices, we had a ton of time to look around for merchandise, drink a cup of coffee to warm ourselves in the chilly morning and took few photos—I knew it would be almost impossible to do so on the weekend. There were some staff people distributing earplugs to the fans. However, I came to get my ears destroyed—I mean it couldn’t be worse than standing next to a big speaker in a concert. Practices started and we had the fortune of seeing many cars taking part of it. I arrived to the racetrack to meet a friend for the qualifiers, before the last session of test practice started. This time, the venue was packed full of fans!.The weather was great, which meant the track was hot, so I knew the qualifiers were going to be amazing. As much as I like rain, and even more, racing on water, it was my first time seeing the F1 in person so I wanted the to see the top speeds. I found that my seat was right on a DRS (Drag Reduction System) zone so that was a great surprise. I had bought the tickets as fast as possible to get a nice spot but didn’t realize how good it was until a day before. After practices finished, historic classical cars started to race. Although their sound was amazing, the cars were slow compared to today’s cars. 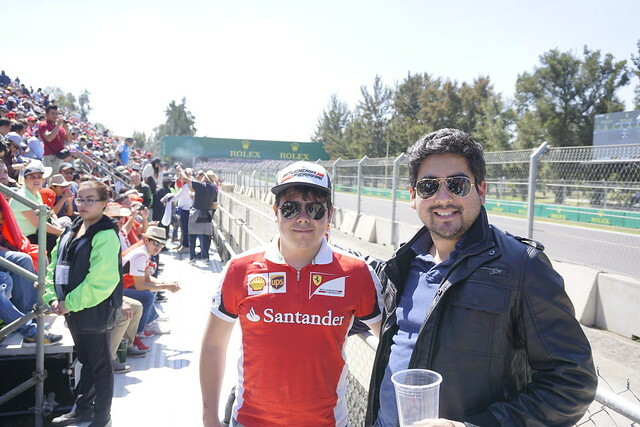 I started to look for a friend who traveled the whole way from Seattle to Mexico City that same morning to join the #F1ESTA. Upon finding him, we went for beer and tequila. The excitement in the air was incredible. The qualifiers started which means that lap times were faster; I didn’t knew if was worth to turn my head when the cars passed right in front of us because it was impossible to follow them at their high speed. When the qualifiers finished I knew that Sunday was going to be a day to remember for a lifetime. We left to get some rest, order for food and attended a Halloween party which we left early to be ready for the Mexico GP. Race start was at 1 PM. We took our time to sleep in and to have a mexican breakfast which included eggs and a lot of salsa before getting into the venue. Mexico City traffic was totally messed up due to the usual traffic and the amount of people getting close the racetrack. We were a couple miles away from the venue when we decided to continue walking as it was impossible to get nearby on a car. We took about 40 minutes walking the 2 miles to the venue, but we arrived at the incorrect gate so we had to make our way to the right one. We arrived just in time to get a beer, meet up with another friend for a few minutes and to see planes drawing the colors of the Mexican flag in the sky. First lap, Hamilton got out of the track and back inside, seconds after yellow flag and virtual safety car. Couple of laps with the safety car inside the track until the race restarted, the smell of the burning tires was very noticeable. People were yelling; commentators had an excited tone of voice. I was completely filled with joy being able to see and listen to the race and absorb the whole F1 experience in person. In the last couple of laps, my favorite 3 drivers (Verstappen, Vettel and Ricciardo) were fighting to get in the 3rd place points; each of them did actually, two of them for few time due to penalties performed right after the race and after the podium.! I cannot stop describing how awesome this experience was. It was one of the best things I ever seen and I would recommend that everyone check out an F1 racing event even if you are not into cars or racing at all. You are not attending just for the race but for the whole event which invites you to embrace the atmosphere and join the big party.